Since 1977, Mane Attraction Salon and its staff has been outfitting its clients with the latest looks out of its longtime home at the northwest corner of 32nd Street and Camelback Road. The salon has undergone a sleek, all-new renovation, both to improve the appearance and overall feel of the salon, as well as to help better serve its clients today and for generations to come. Husband-and-wife owners Kendall Ong and Beate Assmuth-Ong purchased the landmark salon in 1998. “After consulting with our clients and staff, we knew we wanted to open the space to give it more of a seamless indoor-outdoor feel,” Kendall says. Which meant tearing down the signature glass block wall and replacing it with a series of five sleek, floor-to-ceiling glass panels that, in nice weather, will all slide away to open the salon up to the sidewalk. The all-new shampoo room has been partitioned off and expanded, transforming into a relaxing, spa-like atmosphere. 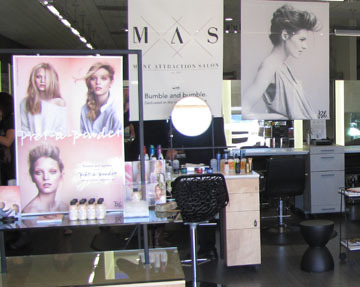 Another space that’s been expanded is the salon’s retail shop, reflecting Mane Attraction’s new status as a dedicated Bumble & Bumble salon, carrying a complete lineup of professional hair care products, as well as providing continuing design education to Mane Attraction’s 25-person staff. Plus, the expanded retail space will now include a carefully curated collection of stylish housewares, collectables and lifestyle products hand-picked by the owners. Mane Attraction Salon is located at 3156 E. Camelback Road. For more information, call 602-956-2996 or visit www.maneattractionsalon.com.